The Epson AcuLaser M7000 printer is an excellent choice for a personal printer. It offers low running costs and is capable of network connectivity (N version), which makes it an ideal solution for small workgroups in need of a dedicated printer. The Epson AcuLaser M7000 has impressive print speeds of up to 32ppm. However, the black and white Epson AcuLaser M7000 printer can only produce monochrome documents and many of its features only come as optional upgrades like duplex printing and extra paper capacity. The Epson AcuLaser M7000 laser printer is compact, thanks to its manageable design, which can easily sit even on small desktops. The AcuLaser M7000 has a 1200dpi print engine, and a built-in 64MB internal memory. Users who do a lot of bulk printing, will appreciate the machine's expandable paper capacity, but the Epson AcuLaser M7000 only offers a 230-sheet standard paper capacity, though the base model does come with a 150-sheet multipurpose tray for handling other media. Some of the best features of the Epson AcuLaser M7000 include its versatile connectivity and large internal memory. 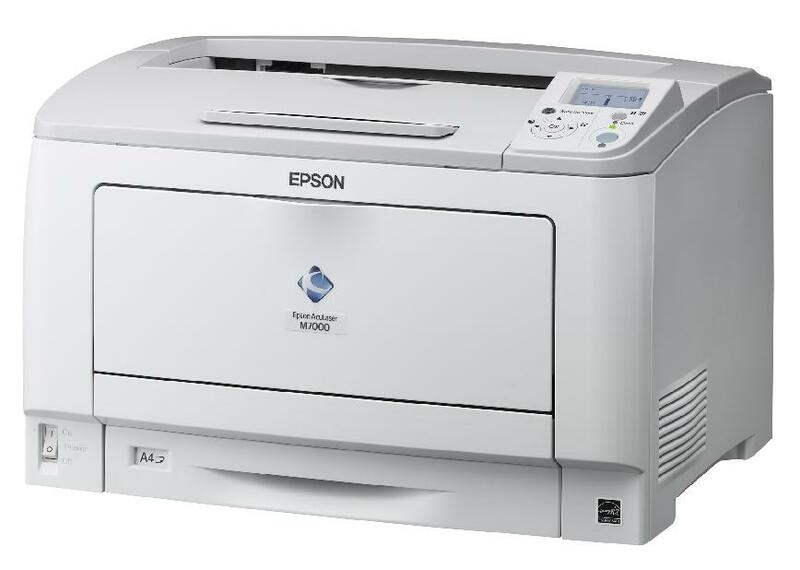 The Epson M7000 mono laser printer also prints fast at 32 pages per minute, using A4 paper. It produces high-resolution prints, whether processing full-page texts or graphics and it offers many optional upgrades for those who want an even more versatile printing device. The cartridges supplied for the Epson AcuLaser M7000 printer will typically print up to 15,000 pages before depleting which keeps the printer running smoothly at an affordable rate. The Epson AcuLaser M7000 monochrome laser printer, however, does not support colour printing. Upgrades such as networking, duplex printing, and extra paper capacity will also cost you extra, though running costs are still fairly manageable even with these upgrades.